Baseball collectors really need to check out 2019 Onyx Authenticated Vintage Collection. Whether you’re into collecting prospects or not, these are some incredible looking cards. Depending on where you shop, a box will cost around $40. Quite affordable. A single box comes with (1) pack. (4) cards come per pack, and (2) of them will be autographed. The base set consists of only (22) cards. (4) players from the base set have photo variation parallels – Brent Honeywell, Taylor Trammell, Nolan Gorman, and Heliot Ramos. These unsigned base photo variation parallels are limited to (30) copies each. All cards have a painted-look, and are printed on vintage stock. Now onto the autographs. As I mentioned before, you’ll find (2) of them per box. Everything is signed on-card, and the signatures look fantastic. Base photo autographs come in the following forms – Blue Ink #’ed/200, Green Ink #’ed/50, Red Ink #’ed/25, and Black Ink #’ed/5. Brent Honeywell, Taylor Trammell, Nolan Gorman, and Heliot Ramos photo variations also have autographed versions – Blue Ink #’ed/25, Green Ink #’ed/10, Red Ink #’ed/5, and Black Ink #’ed/1. I made a guide that can help you with the variations and autograph print runs that go with them. Serial numbers are not printed on any of the cards, and variations aren’t mentioned on the backs. What is listed on all of the card backs are the print runs for the base photo autographs and parallels. For some reason Black #’ed/5 isn’t listed. Please consult this guide before buying or selling any of these cards on the secondary market. You want to make sure you’re selling the correct card. Also, you don’t want to get tricked by someone attempting to convince you that a card is a variation when its not. As an added bonus, autographed cards from previous Onyx products have been randomly included. Issued as redemption cards, you can also find graded rookie cards of Hall of Famers and All-Stars. 2019 Onyx Authenticated Vintage Collection is a quick-thrill and fun rip. Small checklist, but packed with some potential stars. Everything about them is so eye-catching. Topps puts out a bunch of different soccer products throughout the year. I find them to be a nice change of pace. In the past, I’ve pulled some fun cards that includes low-numbered autographs and interesting relics. The patch cards you get from soccer boxes can be absolutely insane. 2019 Topps Major League Soccer is a flagship brand that focuses more on set building and relics. In fact, you won’t find a single autograph anywhere within this product. That’s a little bit unusual as past releases have had autographs. Two formats can be enjoyed when it comes to 2019 Topps MLS – hobby & blaster boxes. A hobby box will come with (3) relics, while the retail blasters have (1). A hobby box will run about $73 as of right now. The base set consists of (200) cards. You’ll notice it has it’s own design separate from that of the MLB flagship set. Parallels include Blue #’ed/99, Gold #’ed/50, Orange #’ed/25, Red #’ed/10 (retail), and Black #’ed 1/1. (15) cards have photo variations. Each has a Black #’ed 1/1 parallel. That hobby box of yours should contain (2) Jumbo Relics, and (1) Dual Relic. Both of course have Orange #’ed/25 and Black #’ed 1/1 parallels. Rarer relics include Crests of Honor #’ed/5, and Nameplate Patches #’ed 1/1. Inserts come in the form of 2018 MLS Award Winners, All-Stars, Throwback Topps, and Young Phenoms. All have Orange #’ed/25, Red #’ed/10, and Black #’ed 1/1 parallels. 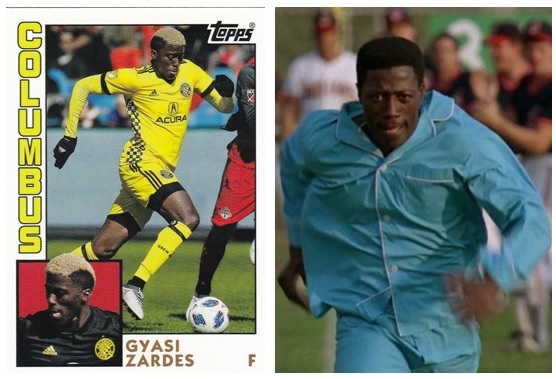 Does anyone else think Gyasi Zardes looks like Wesley Snipes a.k.a. Willie “Mays” Hayes? The autographs are greatly missed by collectors. I’m not sure why those were left out other than to keep the cost down. Overall a fun break. Very solid. Gypsy Queen has become a classic that lots of collectors look forward to opening. Retro designs combined with on-card autographs and bright colors make for some interesting pulls. Before opening a pack, box, or case, I highly suggest reading up on it before diving in. Over the years Gypsy Queen has become quite concentrated with all sorts of goodies to look for. Many of these items could easily be overlooked. Ok. Here we go. The base set consists of (300) cards. Parallels include Green (retail), Purple (Mega Box), Missing Nameplate, Indigo #’ed/250, Gypsy Queen Logo Swap, Bazooka Back, Black & White #’ed/50 (hobby), Red #’ed/10, and Black #’ed 1/1. The Missing Nameplate and Gypsy Queen Logo Swap cards need to be watched for the most. Quickly flipping through a pack could cause you to miss them as they don’t have a different back or border color change that jumps right out. An additional (20) cards make up the Short Prints. You’ll notice that card numbers #301-#320 are of retired stars and Hall of Famers. These have parallels too – Missing Nameplate, Gypsy Queen Logo Swap, Bazooka Back, and Black #’ed 1/1. Despite not being their main purpose, the CMP codes really come in handy when it comes to identifying variations. Especially when Gypsy Queen has so many other things to be watching for at the same time. Its important to note that the Jackie Robinson Day and Player’s Weekend variations have Gypsy Queen Logo Swap and Black #’ed 1/1 parallels. Every hobby box comes with (2) on-card autographs. (15) cards have Jackie Robinson Day variations that have Black & White #’ed/42 and Black #’ed 1/1 parallels. Box Toppers are a common thing for Gypsy Queen. The Box Toppers for 2019 are cool! (3) Chrome cards are awaiting inside the Box Topper pack. These cards look awesome. You even have a shot at some parallels and autographs. Yes. You read that correctly. On-card autograph, Chrome, Gypsy Queen cards. Relics can be found too. These are much more difficult to pull. As always, my favorites are going to be the Power Performers Portrait Art Patch Originals. Topps has made these a staple for Gypsy Queen. I don’t believe any other product on the market has cards like this. One day it would be fun to see them come in a booklet format with an autograph. An upgrade to these would be nice to see. I want to see Bryce Harper in a Phillies uniform with a Phillies patch for 2020 Gypsy Queen. You’ve got to pay close attention when opening Gypsy Queen. Topps packs a lot in here. A hobby box will cost around $110 right now. You’re going to need a lot of luck in order to pull something that’s going to pay for the box. Then again, if all you’re thinking about is getting you’re money back, you’re not doing this for the right reasons. While attending the 40th annual Ephrata Lions Club Sports Card Show & Auction (the longest-running one-day show on the east coast) on 3/30, I saw a handful of dealers selling new wax. One of the products that I witnessed many collectors breaking was 2019 Topps Inception Baseball. People seem to really enjoy it. By the end of the show, I didn’t see many boxes left. The Topps Inception brand reminds me a lot of Star Wars. Especially when it comes to the design. Some years its dark, while other times its light. As fun as the dark-side can be, I prefer my Inception to have the lighter look. That’s exactly what the 2019 version has. It seems to swap back and forth one year to the next. Show prices for a box seemed to settle around $55. Online its a bit higher, and that doesn’t count shipping. I enjoy quick-thrill, one pack per box products. Inception is just that. I hope the format never changes. Housed inside every pack are (7) cards. You should find (4) base, (2) parallels, and (1) autograph or autograph/relic. The base set has (100) cards with the following parallels – Green, Purple #’ed/150, Magenta #’ed/99, Red #’ed/75, Orange #’ed/50, Blue #’ed/25, Inception Black #’ed 1/1, and Printing Plates #’ed 1/1. Matte backgrounds, glossy player photos, and thick card stock continues from previous years. Hits are truly what Inception is all about. Autographs come in a wide range of ways. For the most part, its highly likely your autograph will come from the Base Rookies & Emerging Stars checklist. Really lucky box breakers can find rarer gems which range from Short Print Autographs to Autographed Team Logo Patch Booklets. Not everything is signed on-card, but a good chunk is. Silver and gold paint-pen autographs which are in the Silver Signings set continue to be some of my favorites. Did you pull a redemption for a Mystery Autograph? There are two – A & B. As of this writing we have yet to learn who A will be. Topps recently announced that B is of White Sox star rookie Eloy Jimenez. Every product today can be considered hit or miss. That’s only if you’re concerned about the dollar value of your hit. So many products get unnecessarily bashed today because the hit didn’t pay for the box. If that’s the only reason you’re opening a box, you’re not doing it for the correct reason. Colorful explosion of fun! White stock really makes these cards pop. I can’t wait for baseball season to start. Phillies fans like myself have a lot to look forward to. This past winter the Phillies made some huge moves signing guys like David Robertson, Andrew McCutchen, J.T. Realmuto, Jean Segura, and Bryce Harper. The Phillies have certainly shaken things up. After the Bryce Harper signing, sales of Phillies merchandise began to break all kinds of records. 2019 Topps Heritage Baseball utilizes the 1970 Topps Baseball design. When I think of 1970 Topps Baseball two cards come to mind. The first being the Thurman Munson/Dave McDonald RC #189. Secondly, former Phillies manager Charlie Manuel’s RC can be found on card #194. Other key cards from that original set include Nolan Ryan #712, Reggie Jackson #140, Hank Aaron #500, Roberto Clemente #350, Willie Mays #600, Pete Rose #580, and Johnny Bench #660. This year in particular, Topps did a great job making 2019 Heritage look as close as possible to the 1970 set. Check out this incredibly detailed side-by-side comparison. In 2020, the 1971 Topps Baseball design will be used. All of those black borders should make things fun. Right now a hobby box will cost $90-$100. More affordable retail options are also available. Housed inside each hobby box are (24) packs. As the box is opened, you’ll be greeted with a box topper. Four box topper possibilities can be pulled – 1970 Topps Super Baseball, 1970 Poster (70 copies), 2019 Topps Teammates (70 copies), and 1970 Topps Originals. (500) cards make up the base set. The last one hundred #401-#500 are Short Prints. Parallels are all over the place. The most wide spread parallels are the Black Border #’ed/50 and Flip Stock #’ed/5. Silver Metal, Mini, and Chrome parallels are available for certain cards. Certainly not all (500) cards. The Chrome parallels can come in Purple Hot Box Refractor, Refractor #’ed/570, Black Refractor #’ed/70, Gold Refractor #’ed/5, and Superfractor #’ed 1/1 form. Variations are a big part of the hobby today. Almost every product geared towards set collectors has them. Heritage variations seem to carry much more weight compared to those found in other products. Its just fun to see people spend so much money on cards that aren’t relics and/or autographed. If it weren’t for those little CMP codes on the back, you’ed spend a lot of time looking for these variations. Please take your time and check them. One variation that looks like a simple base card could be worth quite a bit. To put it simply. If the CMP code ends in a number other than #092, you’ve got something worth looking into. (8) inserts are in here to collect. 1970 Baseball Stars Candy Lids, 1970 Cloth Stickers, and 1970 Player Story Booklets are retail exclusives. My favorite insert are the 1970 Topps Scratch-Off cards. I remember buying an original Willie Stargell while attending one of my first card shows. Each hobby box comes with (1) autograph or relic. I’d say 99% of the time your hit will be a one-color relic. Big hits, although difficult to pull, command a huge amount of attention. The autographs, especially the Real One cards, always look top notch. You can’t go wrong with an on-card autograph and a classic design. Topps included (2) Mystery Player autograph redemptions. One labeled “A”, and the other “B”. Most likely these have been reserved for top rookies looking to make their MLB debut later this year. Vladimir Guerrero, Jr. could easily be one. I’d like to see them be of Manny Machado and Bryce Harper in their new uniforms. Topps is king when it comes to Chrome-based products. It doesn’t matter if its baseball, football, or professional wrestling, there will always be a core group of collectors lining up to rip into a box. I bet if Topps made a Chrome set based solely on the Swiss curling team it would sell. If you’re into Premier League soccer, you might have some fun with the new 2018/19 Topps Chrome Premier League product. Boxes sell for around $55. Inside every box there are (18) packs containing (4) cards each. You’ll also find (1) autograph per box too. The base set is comprised of (100) cards featuring top players from the Premier League. Topps chose to use the 2018 baseball flagship design. They did the same thing with 2017/18 Topps Chrome UEFA Champions League. Parallels are what make Chrome products so great, and this set has plenty of them. Base set parallels include Refractor, Purple Refractor #’ed/250, Blue Refractor #’ed/150, Green Refractor #’ed/99, Blue Wave Refractor #’ed/75, Gold Refractor #’ed/50, Orange Refractor #’ed/25, Red Refractor #’ed/10, Red Wave Refractor #’ed/10, and Superfractor #’ed 1/1. While ripping through your box, its a good idea to check the CMP code on those standard refractors. There are (5) image variations to watch for. Each has a refractor-like coloring, and the CMP code on the back ends in #08. Base cards end in #88. Superfractor versions of these variations exist as well. The five players these apply to are Harry Kane #1, Romelu Lukaku #22, Kevin De Bruyne #50, N’Golo Kanté #63, and Mohamed Salah #100. Here is a nice little guide I made to help. Autographs come in four different formats – Base Chrome, New Signings, Premier League Debuts, and Superstar Sensations. The Base Chrome Autographs have Blue Refractor #’ed/150, Green Refractor #’ed/99, Blue Wave Refractor #’ed/75, Gold Refractor #’ed/50, Orange Refractor #’ed/25, Red Refractor #’ed/10, Red Wave Refractor #’ed/10, and Superfractor #’ed/1 parallels. The only parallels the other autographs have are Superfractors. New Signings, Premier League Debuts, and Superstar Sensations all have unsigned counterparts. No matter the sport, Topps Chrome always offers up a lot. Between the image variations, refractors, and guaranteed autograph, the risk is fairly spread around. You can’t beat it for $55.